I received an e-mail the other day stating that the books for Ghosts Of Hefei, the sequel to The Department, are nearly finished and some of the miniatures are already started shipping. I thought I would play a campaign of The Department to get ready for it. If you're unfamiliar with the game, here is a link to my review The Department: Goalsystem Noir Investigation Skirmish Review. For this campaign, I picked as the prime suspect RMB-O, a grade 8 fabricant terrorist. 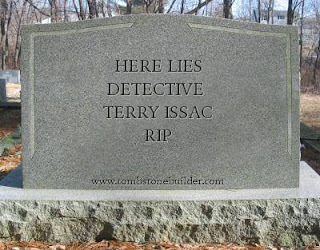 My character's name, created with a name generator, is Terry Issac. Terry likes to hurt people and doesn't care much about police work except for the pay (Bills To Pay), his training has taught him to act like a thug with a badge (Pacification) and he works for the Fabricant Crimes Unit. He carries the DFM standard issue slug pistol. And surprisingly enough he looks like Harrison Ford. This will be Detective Issac's first case as a new member of the Fabricant Crimes Unit. Mission 1 in The Department is called Grass The Neighborhood and its objective are to gather people evidence off of 3 persons of interest. Here is a picture of them. Here is the setup at the beginning of the game. The 3 persons of interest are placed randomly within the city and 2 are surrounded by crowds. Detective Issac moves up to interrogate his first suspect. Detective Issac moves into the crowd and within 3 inches of the first person of interest so I roll for the interrogation and it results in the POI being unwilling to give up any information so Issac intimidates him and passes receiving 1 piece of people evidence. So far so good! Detective Issac moves up to the second POI. Detective Issac interrogates the second POI but this one gets scared and runs off while some of his gang member friends appear from within the crowd. Suddenly this has turned from an easy going interrogation into a showdown. Four hostile gang members now surround Detective Issac all armed with slug throwers. The second POI turns and thinks about firing at the detective but decides better of it and keeps running. The first gang member attacks with his slug thrower, and being within point blank range gets a +2D to his attack roll. The gang member rolls 2 passes and Issac rolls his ranged dodge and gets 2 passes as well so the first attack misses. The second gang member fires as well with the same results, 2 passes vs 2 passes so the second attack misses as well. The third gang member moves toward cover and fires at Issac scoring 3 passes. Issac only has 3 vitality and 4 dice to roll for his ranged dodge so I decide to use 1 Fate point and get 4 passes so the third assailant misses as well. So far this fight isn't going to bad for Issac. The 4th and last gang member attacks and hits with 4 passes, I use Issac's last 2 Fate points and rolls but only get 3 passes so Issac loses 1 vitality point leaving him 2 left. Detective Issac takes his turn and moves as far from the crowd and attackers as he can. He fires at the closest gang member and rolls 2 passes as does the gang member so no hit. To start this turn the second POI decides to keep running. Now that Detective Issac is outside of the crowd the gang members need to move out of it to fire at him. The first gang member moves away from the crowd and takes a shot. He passes 2 and Issac only passes 1 so Issac takes another vitality hit leaving him only 1 left. The second gang member attacks and rolls 2 passes. Since Issac cannot take another vitality hit I use 2 Fate and roll 2 passes so the second shot misses. The third gang member attacks and rolls 4 goals. Issac only has 1 Fate point left so I use it and need to pass 4 out of 5. I roll and only pass 3 leaving Detective Issac dead. Well, that couldn't have gone worse if I tried. I should have either brought some backup or a bigger weapon which could have changed the outcome. Now that an officer has lost his life trying to apprehend RMB-0 the Fabricant Crimes Unit is going to work even harder to try and get him. Click here for the next mission!